Jamie, 17, a High School Student in Buffalo, has been a resident at Plymouth Crossroads for the past five months. 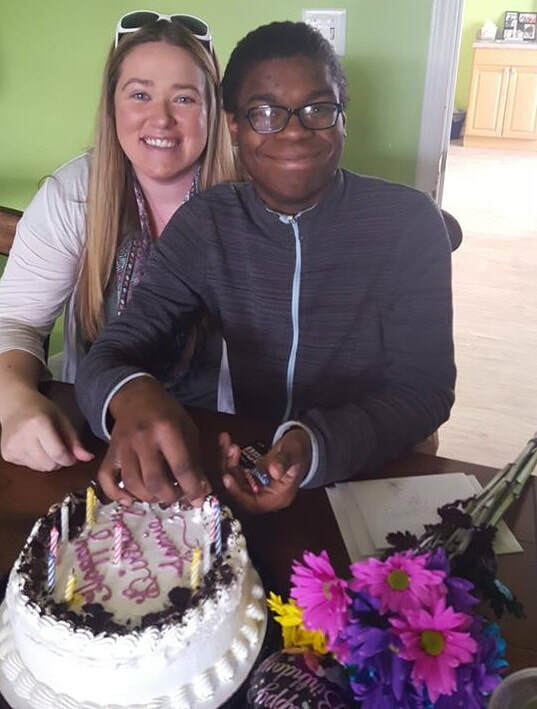 In that time Jamie has celebrated his 17th birthday with us and found the time in addition to school to be a leading member of several youth groups in the city of Buffalo. The two groups he is the most involved in are the Just Buffalo Writing Center where he is a Youth Ambassador and GLYS, Gay-Lesbian Youth Services, a group for LGBT teens. Jamie took the time to tell me a bit about his work as a youth ambassador at the Writing Center. Just Buffalo Writing Center is a place where people can attend workshops to build their writing skills or just take time to work on their writing. As a Youth Ambassador Jamie has been going to the Center for a long time and now helps organize events and represent the other youth at the Writing Center. When asked what he writes about Jamie answered that he mostly writes about “My life and my feelings.” Recently he’s been very involved in a series of open mic events hosted by the Just Buffalo Writing Center called Spotlight On Youth or SOY. Jamie has performed at every one of the events he has gone to and has even hosted one night. Currently he and another writer from the Center are preparing for a showcase featuring their work. Jamie’s writing mostly takes the form of rap songs he performs and that he hopes to make a career out of. When asked about his plans for the future Jamie said he is currently looking ahead to attending college with his eyes on a university in Florida where he hopes to study music production and performing arts. For those of you who met Jordan in our Resident Spotlight Feature in the Plymouth Crossroads Newsletter and wanted to learn more, look no further! To get a copy of Plymouth Pulse Volume 1, Issue 1 : Plymouth Crossroads Newsletter, click on the Plymouth Crossroads Newsletter link above. Comic books and esoteric pursuits. I study Tarot and astrology pretty heavily. Reading poetry. Jordan’s story was captivating. It is easy to go through life trying to avoid these hard stories that happen to other people in real life. I mentioned to Jordan that there are people in this world who don’t realize that these types of things actually happen. These young men telling their stories is important because it informs people that there are young people in the world who have done nothing wrong and still have their innocence stolen from them by others who are close to them. Jordan’s is just one of many stories that are similar in structure, but very different in scope and detail. Hopefully one day there won’t be any.